Rocky Mountain Recreation Area is located off the beaten path in Northwest Georgia near Armuchee (pronounced ar-mer-chee). The 5,000 acre park is the product of a partnership between Oglethorpe Power and the Georgia Department of Natural Resources. Rocky Mountain Recreation Area is a wonderful local resource that is almost free ($5 parking fee) for the public to use. There are two lakes, a beach, a playground, and a beautiful campground with water and electricity. 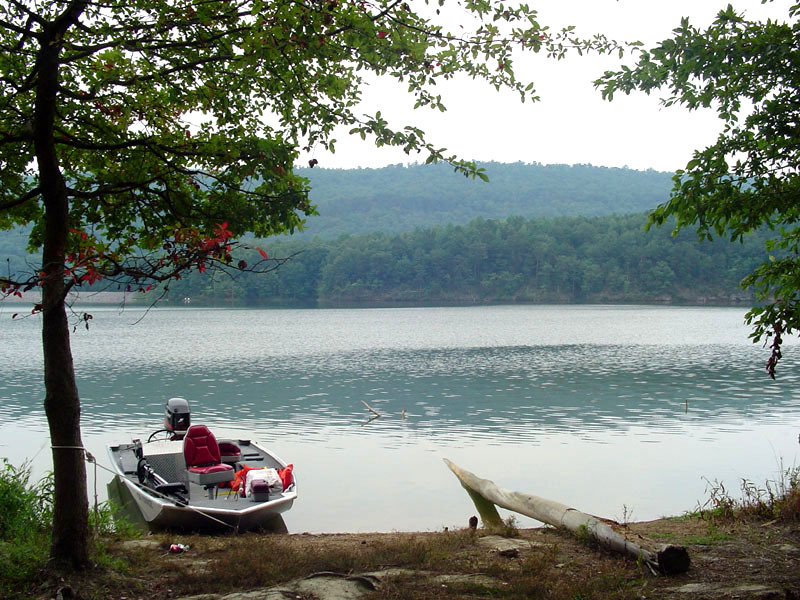 The campground is filled with tall hardwoods and pines that go right down to the edge of the water. As can be expected lakeside camping sites are not very level (typical for lakeside campsites), but they are large and shady. Non-lakeside campsites seem much more level. One of the best things about Rocky Mountain Recreation Area is the ability to pull your fishing boat (or canoe or kayak) right up to you campsite. You have to make sure to secure your watercraft though because water levels fluctuate based on electricity demand. Water is pumped into a reservoir on top of the mountain during low-demand times, then released to generate electricity as the demand increases. It’s like a battery.